Merry Christmas to all who celebrate this festive Winter holiday. Today was the last of Chocolate and Hazelnut Theme Week, and as I transitioned to Day #2 of Chocolate and Lemon Theme Week. I enjoy a small shot of decaf espresso with lemon peel now and then. 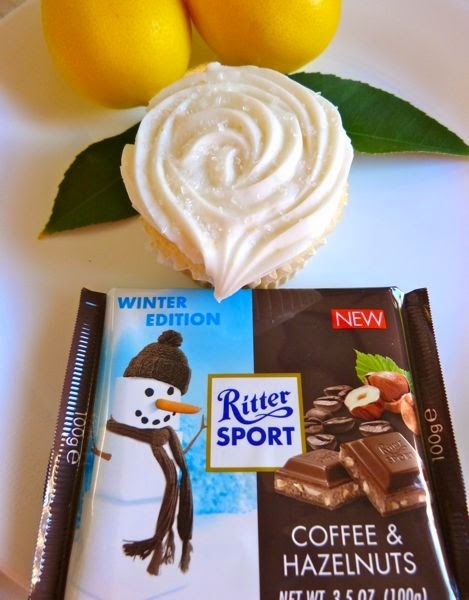 Lemon + Chocolate + Coffee can be great together in the right proportions. 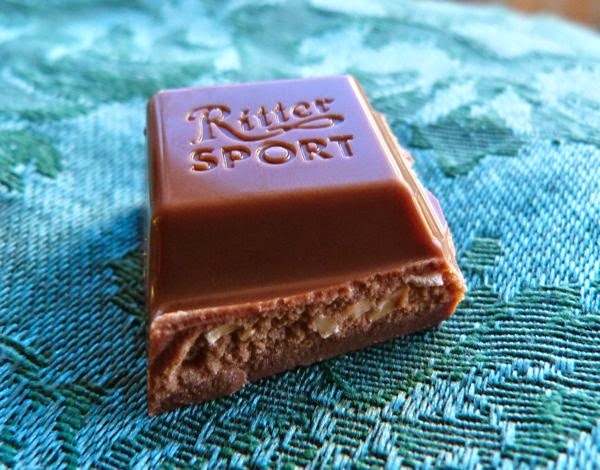 I tested that theory with today's holiday "Winter Edition" Coffee and Hazelnuts bar from Ritter Sport (Germany), with the picture of the white sugar cube "snowman" on the front. No snow here in California where I live, but we do have lemon trees and access to gluten free lemon baked goods. So I paired this bar with a tasty, gluten-free Limoncello cupcake (from Ginger and Fox Bake Shop, Valencia, CA), and some hot lemon leaf tea. One could also try melting part of this smooth, coffee infused chocolate bar with chopped hazelnut bits into cup shapes and fill said cups with lemon different fillings (lemon curd, lemon panna cotta, lemon zest, etc. ).